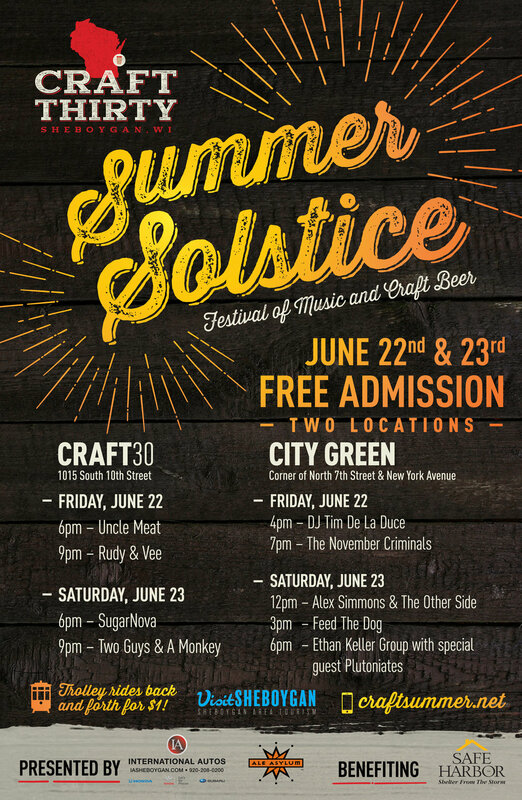 Craft30 Summer Solstice is a free-admission festival of music and craft beer. Visitors are welcomed to enjoy live music by all-Wisconsin bands & a huge selection of Wisconsin/Midwest craft beer at two locations; Craft30 (1015 South 10th Street) and City Green (Corner of North 7th Street & New York Ave). WWW.CRAFTSUMMER.NET. Produced in association with Visit Sheboygan, City Green, and the City of Sheboygan. International Autos of Sheboygan will present the entertainment lineup on the open-air stage at City Green, located between the Mead Public Library and the John Michael Kohler Arts Center. The Subaru, Toyota, & Honda dealer group will also feature a new vehicle showcase. Ale Asylum (Madison, WI) is the Official Craft Beer sponsor for both locations. Milwaukee funk supergroup Ethan Keller Group (Saturday, 7pm) will headline the fest at City Green. Front man Ethan Keller is a National touring artist and was awarded Solo Artist of the Year - 2011 Radio Milwaukee Music Awards + Pop Artist of the Year - 2011 Wisconsin Area Music Industry (WAMI) Awards. Sheboygan’s Plutoniates (Saturday, 6pm) will open the show as a special guest of EKG. Milwaukee artists The November Criminals (Headliner – Friday, 7pm) proudly hold the title of the world’s only non-ironic Polka Hip Hop band, blending the power & energy of hip hop with fun, traditional polka. Their lyrical topics typically include beer, pirates, history, class struggle, anti-fascism, humanism, and global unity. See them headline at City Green on Friday evening. Representing the Fox Valley, Appleton’s Feed The Dog (Saturday, 3pm) will perform original Folk Music & Americana. Sheboygan’s DJ Tim De La Duce (Friday, 4pm) and Alex Simmons & The Other Side (Saturday, 12pm) will perform at City Green as well. Live music at Craft30 will feature the return of our original inaugural festival headliner, Sheboygan's favorite, SugarNova (Saturday, 6pm) on the outdoor stage with Uncle Meat (Friday, 6pm). Craft30’s outdoor patio & beer garden, plus the addition of a 40’ x 40’ beer tent, will provide the backdrop for these powerful local rock outfits who are highly experienced at entertaining Sheboygan live music fans. The indoor stage at Craft30 will feature` Milwaukee artists Rudy & Vee (Friday, 9pm), an acoustic guitar & saxophone duo that has built a loyal following in the area with their full band Cold Sweat & the Brew City Horns. Two Guys & A Monkey (Saturday, 9pm), another Milwaukee duo, bring explosive musicianship, R-rated musical comedy, and even traditional German beer hall standards. Safe Harbor of Sheboygan County will benefit by raising funds through a 50/50 raffle and Celebrity Beertender Challenge. Volunteers looking to help support the event can contact Safe Harbor at (920) 452-8611 or info@sheboygansafeharbor.org. Food vendors at City Green will include Parker John's BBQ & Pizza, Harvest Café, and Black Pig Brand new food truck Sammiches-n-Stuff will park outside the Craft30 location all weekend. Ahnapee Brewery, Appleton Beer Factory, Badger State Brewing, Capital Brewery, Great Lakes Brewing Co., Hinterland Brewery, Loon Juice Hard Cider, Next Door Brewing Co., O’so Brewing Co., Revolution Brewing, Stone Arch Brewpub, WarPigs Brewing, and Zambaldi Beer.